Are you a lover of gadgets and machines in Minecraft? Mindful of this mod! 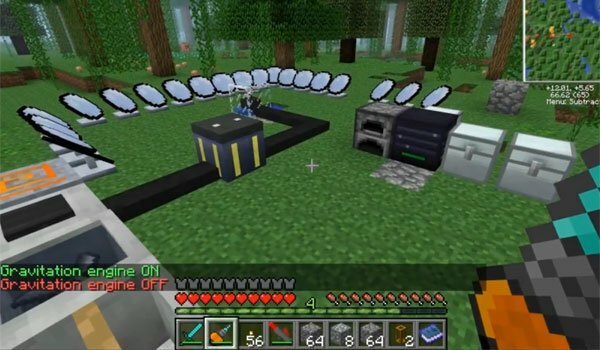 Factorization 1.7.2 and 1.7.10 is a modification that will bring new machines to process minerals and crafting, to become an engineer with a whole bunch of new machines and tools. We emphasize the crafting table pocket that lets you directly from the inventory crafting and anytime. Also new powerful barrels that allow you to store stacks of the same type of object. Add two major machines: the Maker and Stamper. The Maker makes crafting packages you must put in to get the crafting Stamper. Can be placed, for example, to obtain bone dust. If a recipe have various outcomes, such as cake, all other ingredients used is placed in the outlet slot. You can get machines to craft swords just by one click and everything else your imagination can do with these new machines. This mod also adds new minerals like silver and a new furnace called Slag Furnace, which works as normal but has a slot spends twice more and more coal. How to install Factorization Mod for Minecraft 1.7.2 and 1.7.10?